7.75 points at 40 votes (rank 137). 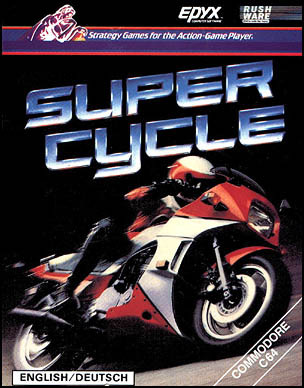 Super Cycle is a linear motorcycle racing game, where the driver has to reach the finish line in a certain time in each level. 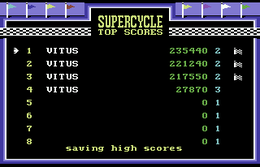 Apparently, the game was inspired by the amusement arcade successes Out Run and "Hang-On", but in the end it plays rather like Pit Stop or Pole Position. Before the start you can choose the colour and the design of your leather jacket and your bike. During the race itself you fight with your three gear vehicle against centrifugal forces and other motorcycles. If you touch the opponents only slightly, this has no effect except for a short dangling. But if you crash with high speed into another driver from behind, the own driver will fall, the motorcycle explodes and you have to speed up anew. In the first levels the street can be used in its full width and is cleared examplarily. In the later levels potholes (which look more like molehills), oil, water and ice puddles as well as barriers are added as diffculties. Other than in e.g. "Out Run" the driver stays behind the finish line and the race is restarted in the new level. Every three level there is a bonus level, where you can collect points by driving over flags. Graphics: The grahpics is very fast, with maximum speed a good feeling fo the speed arises. The motorcycles are designed nicely and lean chic into the curve. The background to the left and right is quite monotonous as usual in this genre, but at least the usual mountain sceen with clouds or - depending on the level - a skyline or something similar scrolls at the horizon. In one of the last levels something unexpected happens with the landscape, but more cannot be revealed here (spoiler alarm!). The race itself takes place on half of the screen, the lower half is used for displaying the rev meter, the gear and the tachometer, below that you see the time that is left and the current score. A small graphical highlight is the flag of the starter. Sound: In the race itself a monotonous motor sound gets on one's nerves, but the nice title music and the music in the menues compensate for this. Highscore list: A highlight is the highscore list, which can keep 99 !! entries and is also saved on disk. On certain tracks (especially in curve sections) it is sometimes better not to take over, but stay behind another motorcycle, as else you will inevitably collide with an obstacle at the roadside. In sharp turns or precarious situations it is seldom a mistake to brake slightly, which one easily forgets in the flush of speed. Pressing the keys RUN/STOP + RESTORE at the same time switches off the counter. Rockford: "Racing game that is kept very simple and comes up with nice and fast graphics. In the long run it is a bit too monotonous and little diversified. If you drive with maximum speed, inhuman reactions are demanded from the player in the later levels, as in or before turns there is hardly time to brake. 7 points from me, as it is good for a round in between and the presentation is well done except for the racing sounds." Robotron2084: "The only motorcycle racing game on the C64 that I really liked to play. Solid graphics and good gameplay. 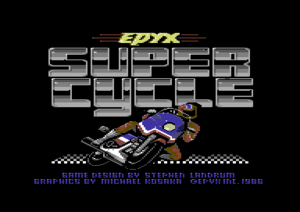 Another quality product from Epyx. From me also 7 out of 10 points." Spaceball: "My absolute favourite title amongst the racing games. This game has fascinated me more than all other racing games. I also liked choosing the leather togs. From the playing point of view it is surely absolutely unnecessary but for C64 standards absolutely great." Shakermaker303: "Solid racing game with much speed. Apart from that nothing to highlight. Always nice to play..."
TheRyk: "Clearly one of the better racing games on the C64. Sadly, there is no fast ingame music which could have made the rather longish rides a little more entertaining for the player. Big plus for the really well-balanced difficulty levels. 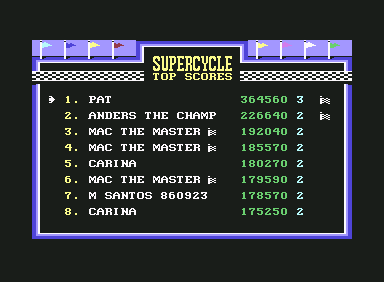 Those who have failed the tricycle licence in kindergarten choose level 1, racing experienced players should immediately pick level 2, level 3 is for the Schumacher brothers. 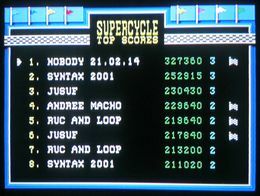 Super Cycle is to be found exactly between Enduro Racer and Buggy Boy in my racing charts with super 8 points!" This page was last modified on 4 April 2015, at 17:40.